Skin Peels. Are they safe? brighter, smoother and younger looking skin. A skin peel is a deep exfoliating treatment using the AHA's and BHA's acids, that removes dulling dead skin cells from the skin surface, minimizes skin pores and stimulates skin cell renewal, which result in deep pore cleansing, skin revitalization, smoothing and brightening. DR IRENA ERIS Peel is a quick 30 minutes treatment using the combination of extremely effective 38% Glycolic and Lactic Acid and 20% Mandelic Acid for sensitive skin with no downtime. Some skin types, especially dry and dehydrated can experience redness straight after treatment that will come down in the next two hours or can peel 2-3 days after in salon treatment. Treatment is simple and safe for the client. After double cleanse, a therapist de-grease the skin with a special product and then apply the acids onto dry skin and leave for 10 minutes. Some redness and tingling sensation can be experienced. Then the acids are neutralized and skin is rinsed thoroughly with water. A soothing mask is applied to calm down the skin. After 5 minutes the mask is removed and finishing BB Cream SPF 50 is applied to protect the skin against UVA& UVB. HOW OFTEN TREATMENT CAN BE REPEATED? Dr Irena Eris Peel should be done as a course of 4 peels once a week. Peel is a great introduction to other revitalizing treatments. It deeply cleans skin pores allowing for better penetration of active ingredients from the following skincare products and treatments. Peel is beneficial for all skin types, all ages, women and men. It's recommended to have a course of peels twice a year. broken skin, skin irritations, inflammation or swelling, sunburn, eczema, psoriaris, use of any medically prescribed exfoliating product, recent professional resurfacing treatment, pregnancy and breastfeeding. To sum up, skin peel is a safe and very beneficial treatment for the skin when it's done by qualified therapist with branded products (not bought over internet) and when you follow all the pre and post treatment recommendations. If you still feel nervous about the peel, try first a home care product containing the acids and see how your skin reacts and feels. If you are happy with the results, then book a salon treatment. Get ready for bright, even and glowing skin! This vibrant, hydrating and beautifying compound is about to revolutionize your beauty routine and transform your complexion. Vitamin C is gaining momentum as a heavy hitting beauty powerhouse because it is vital to the process known as collagen synthesis. Collagen is responsible for supple, youthful, and radiant skin and it naturally deteriorates with age and exposure to free radicals. Vitamin C helps stop that deterioration in its tracks by stimulating the natural production of collagen. An added bonus? Vitamin C combats free radicals and environmental toxins - leading to glowing and clarified skin. There is also a growing body of research that has demonstrated a direct relationship between Vitamin C and a reduction in the effects of sun damage. This is holy grail news for summer lovers everywhere! If you want in on the Vitamin C action, look no further! I am thrilled to announce that Skin Care Room is now stocking DR IRENA ERIS Perfect Revival skin care line. Perfect Revival cutting edge products features ultra-stable Vitamin C, smoothing AHA’s and anti-ageing peptides to DELIVER LUMINOUS, YOUTHFUL AND POSITIVELY GLOWING SKIN. Perfect Revival is a total system that works holistically to revitalize, regenerate, and brighten your complexion. Want to reduce wrinkles, dullness, and discoloration? Perfect Revival has you covered with tangible and fast acting results! These products reduce the number of wrinkles by up to 53% and reduce discolorations by up to 13%. This dynamic suite of products works synergistically to improve all aspects of your complexion. Illuminated and radiant skin is finally within reach! Come into SKIN CARE ROOM - FACIAL TREATMENTS and find out how you can incorporate Vitamin C into your skincare routine - Today! Sign up with your email address to receive news, beauty tips and offers. Thank you gorgeous! You’re in. NEW! Skin Perfecting, Instant Anti-Wrinkle And Illuminating Treatment. Say bye-bye to your dull and tired looking skin, wrinkles and uneven skin tone. Be a fresh-faced beauty with our NEW and POWERFUL Vitamin C +AHA 35% Treatment! One-off treatment for an instant effect or in course of 4, one every week to quickly improve the skin condition. 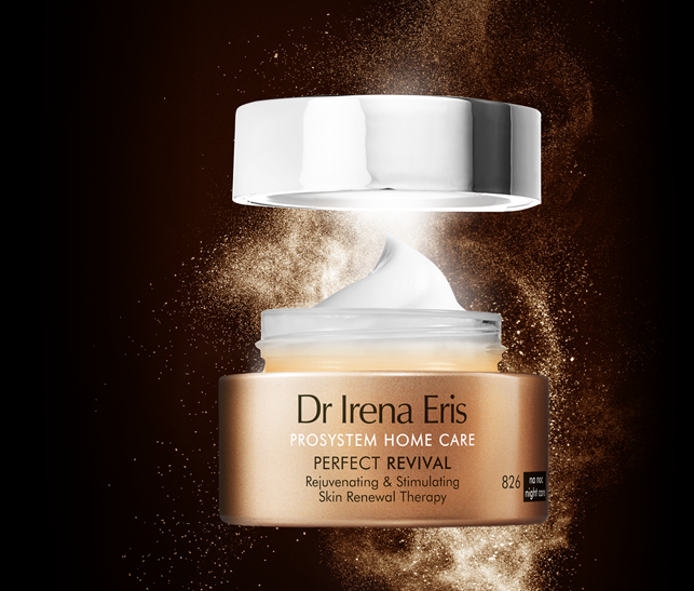 To prolong and maximize the treatment results, follow with Dr Irena Eris PERFECT REVIVAL product range. Vitamin C (Ascorbic Acid) is a water-soluble antioxidant and a vital compound in the collagen synthesis, which keeps our skin supple and firm. It also brighten skin discoloration, strengthens and seals the blood vessels thus reducing skin redness and at a concentration of 20% and above it exfoliates the skin. This well known ingredient wasn't very popular until now because, like many natural ingredients, is unstable when exposed to variable environmental conditions. It is only stable at a pH level below 3.5 and penetrates the skin as a micro particle. Formulating a stable vitamin C serum safe and effective for topical use has been a challenge for beauty chemists. Dr Irena Eris has created a Vitamin C pills that are dissolved in AHA (alpha hydroxy acid) liquid with very low pH 2.0 just before the treatment for an intense revitalizing, anti-wrinkle and illuminating effect. Preparation of the solution immediately before the treatment guarantees the highest effectiveness and stability of the product. AHA (Alpha Hydroxy Acid) is an organic acid obtained from food products such as sugar cane, sour milk or citrus fruits. Acids are very effective in dead skin exfoliation, accelerating cells renewal and skin brightening. The AHA's used in Dr Irena Eris products and treatments are encapsulated in lamellar structures what allows gradual and controlled diffusion of AHA into the skin. It leads to more effective and safer skin exfoliation, without skin irritations. Hexapeptide is a synthetic anti-wrinkle ingredient that activates the natural mechanism for repairing DNA damage. It can affect the rejuvenation of the skin cells by up to 11 years, by making the wrinkles less visible and improving the cross-linking of the skin. 24K Gold in form of pure micro-particles. It stimulates collagen synthesis, reduces existing wrinkles and prevents formation of new ones. Micronized Pearl Powder improves cell metabolism, regenerates, reduces visibility of wrinkles and skin pores, improves skin tone. Don't just dream about beautiful skin. Schedule your treatment Now! Skin Peels - are they safe? Get my posts straight to your INBOX. Find a cleanser that works for you. There is no doubt that cleansing is the first step to beautiful skin but there is a lot of confusion which cleanser to choose, which one will work the best for you. In this blog, I will guide you through all the cleansing products available out there. CLEANSING MILK is an old formula but still great for everyone who doesn't like using water on their skin especially for tight, dry, dehydrated and sensitive skin conditions. You apply the product on the cotton pad and wipe the skin until cotton pad is clean. It's recommended to use toner afterwards to remove any milk residues. Some cleansing milk have more creamy formula and then you can apply them directly to you hands and massage into skin. The residue can be removed with cotton pads or moist face cloth. CLEANSING CREAM is similar to cleansing milk it just have a thicker, more creamy consistency but it is not solid cream. Apply with your hands directly to the dry skin, perform some circular movements and rinse off with warm water and face cloth. Cleansing cream is perfect for mature skin, dry, dehydrated and sensitive skin. CLEANSING GEL is another classic cleanser recommended for oily and sensitive skin. It can be applied on a wet skin with your hands in big circular motions until some kind of foam will create, then rinsed it off with warm water and face cloth. CLEANSING FOAM is a similar to gel product except it is already foamed so it is more gentle on the skin and feels very light and fresh. It is perfect for oily and sensitive skin. OLEO-GEL is a beautiful, innovative product for face cleansing and heavy make-up removal. It should be apply on a dry skin and massage into. It looks like a gel but after few massage movements it will turn into aromatic oil so you can perform a mini massage while cleansing your skin! Recently I tried and fall in love with Dr Irena Eris Oleo-gel that comes with a complimentary super soft face cloth. Oil attracts oil so oleo-gel perfectly removes the make-up, nourishes the skin and relaxes your mind thanks to its aromatic oils. If you have oily skin, you still can use it as a first cleanse (precleanse) and then follow with your usual cleanser. MICELLAR WATER/ LOTION is an innovative cleanser that replaces cleanser, make-up remover and toner. Its bonus point that it doesn't required rinsing with water so it is a perfect product on the go. You just apply the water on a cotton pad and wipe the skin until the pad will be clean. It is very easy and quick to use and may be used everyday, morning and evening. In general, all cleansers can be used by all skin types and it is up to your personal preference of product consistency and method of application. 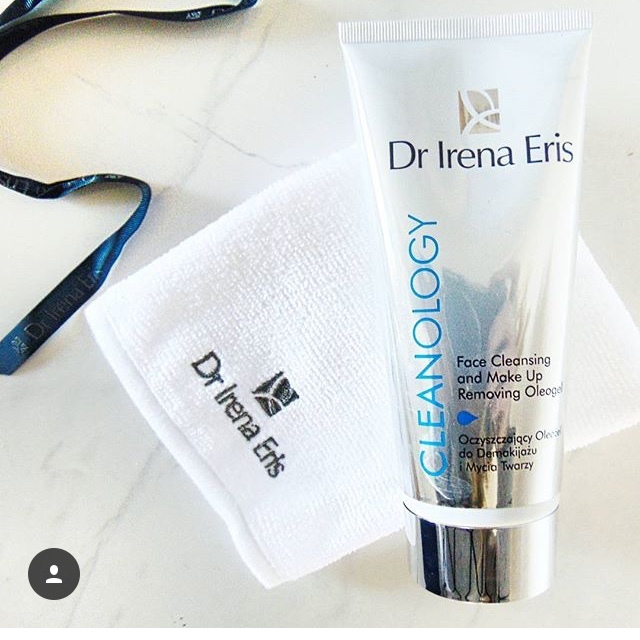 I'm using two cleansers at the moment: light and fresh Dr Irena Eris Micellar Gel in the morning and relaxing Dr Irena Eris Oleo-gel in the evening, when I have more time to pamper myself. And what cleansing product do you use? What is your favorite one from all you have been using so far? Ultimate UP-LIFT Eye Treatment was featured in Stellar Magazine. It was great to see our product together with some well established on Irish market brands. EYES ZONE Ultimate Up-Lift Eye Treatment combines a unique active formula with advanced and precise method of application for maximum results, right away. It improves smoothness and tightness around the eye area just after the first application, it reduces puffiness and dark circles and firms the skin. Not only Stellar magazine has praised this Amazing Eye Rescue Product. We have also received many fantastic reviews from Irish beauty bloggers and product quickly moved into the Bestseller category in our Dr Irena Eris Online Shop. Please see below some of bloggers comments. The skincare technology in this product is incredible, as it works on the deeper levels of the skin targeting specific problems ensuring your eyes look better, but more importantly feel better too. Using this massage applicator, the removal of toxins away from the area is increased and the absorption of oxygenated blood is increased, giving you healthier skin around your eyes. "New hero product alert! Who got time to put on sun screen and foundation? Delira with the consistency and tone of this formulation @skincarepro.ie It's got just enough coverage without looking like a mask, with the added bonus of SPF 50. Winner!"